Home-Man is committed to provide best cost-effective products. This multi-purpose tray have excellent quality with lifetime guarantee. Reach out to us if there's ever anything you need; we are dedicated to your satisfaction. Your floors are an expensive investment. Whether it's carpet or hardwood, nothing is more visually unappealing in your home than a stain you can't get rid of. 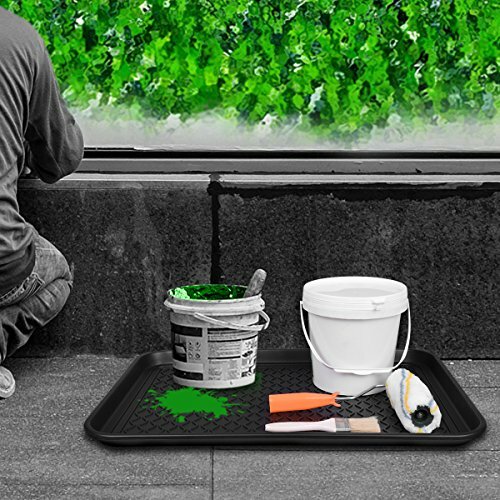 Home-Man multi-purpose tray mat is made of high-grade polypropylene and designed with raised edges to contain water and dirt, and prevent spills from happening. Use it indoors, outdoors or anywhere else that makes a mess! Whether you've got a home full of pets to feed or spend your free time gardening, the multi-purpose tray keeps your floor and belongings dirt free. 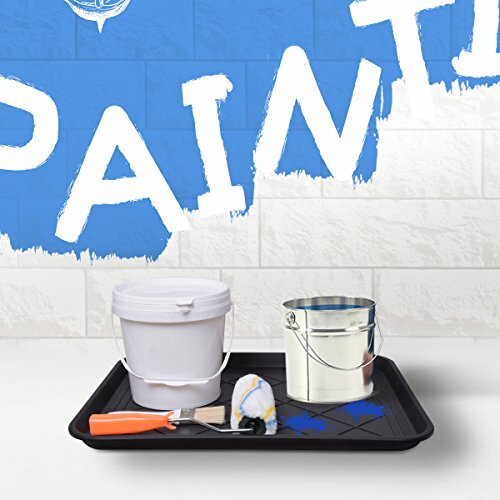 Use it to hold your paint and prevent floor spills, or simply use it to keep your belongings clean while out gardening. It's the perfect companion to your everyday active at home lifestyle. You can even use this awesome tray mat in your car or under the sink! Start enjoying the squeaky clean life. Dimensions: 20" L x 15" W x 1.2" H. Color: Black. MAKES FOR THE PERFECT SHOE TRAY - Live in a snowy and rainy city? 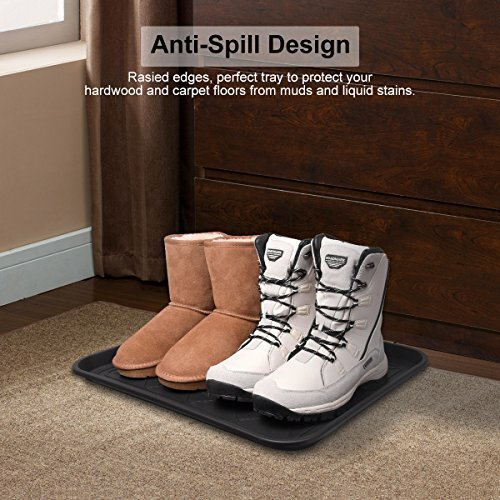 This boot mat tray is sized perfectly to handle a wide array of shoes, boots and slippers under any condition, indoors OR outdoors. 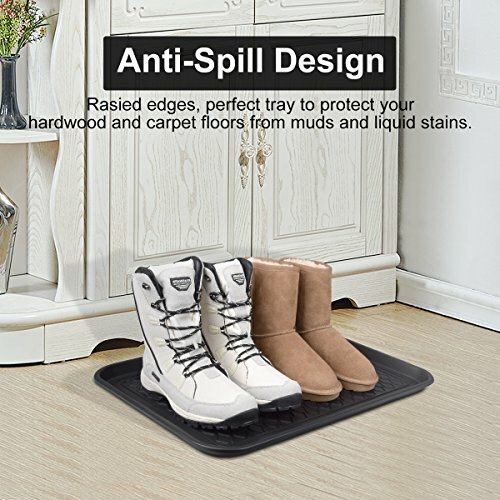 Whether you live in the snow or red clay, you'll LOVE having a safe place to store those shoes and keep your carpet nice and clean. 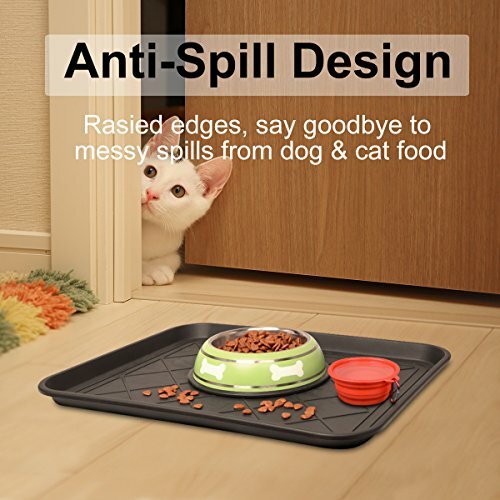 PERFECT FOR YOUR PETS: Say goodbye to messy spills from dog & cat food or water, pet food bowls and cat litterboxes. 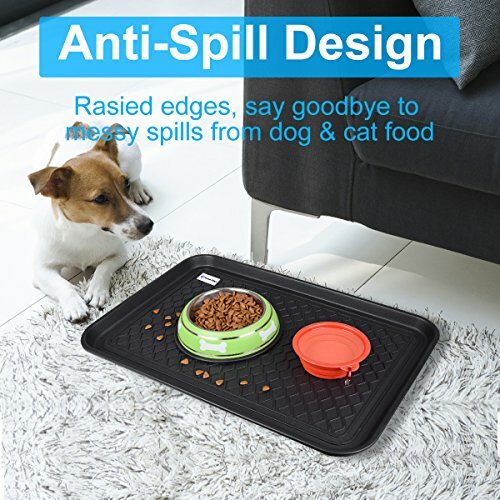 The solid, spill-proof polymer and raised edges keep the food and other debris contained within the tray, making it the perfect cat litter tray mat and more. ALL WEATHER USE- Raised 1.2" inch edges serve as a spill containment tray to protect your hardwood and carpet floors from mud, paint, pet or liquid stains. This tray can be used both indoors and outside. Keep one in your entryway or mud room to catch water from rain or snow and every day dirt. You also can keep one on your porch or deck to keep dirt and water from ever coming in your home. EASY TO CLEAN- The hard plastic easily rinses clean with plain water, and you can use a soft cloth to take care of more stubborn dirt deposits. Use another soft cloth to dry the tray thoroughly before the next use. LIFETIME GUARANTEE - Excellent quality with lifetime guarantee. Materials: 100% Recycled Polypropylene. Dimensions: 20" L x 15" W x 1.3" H. Color: Black.